After exiting the Champions League, FC Barcelona are focused on the domestic league, a competition in which they remain unbeaten and with the option to beat Real Sociedad’s record of 38 games without defeat. The culés equalled the streak last time out against Leganés, and now receive Valencia at the Camp Nou (4.15pm CEST), in the match corresponding to the 32nd week of the championship. For this game, Ernesto Valverde will not be able to count on Ivan Rakitic and Lucas Digne, both of whom are injured, as well as Aleix Vidal and Yerry Mina, both left out by the coach. 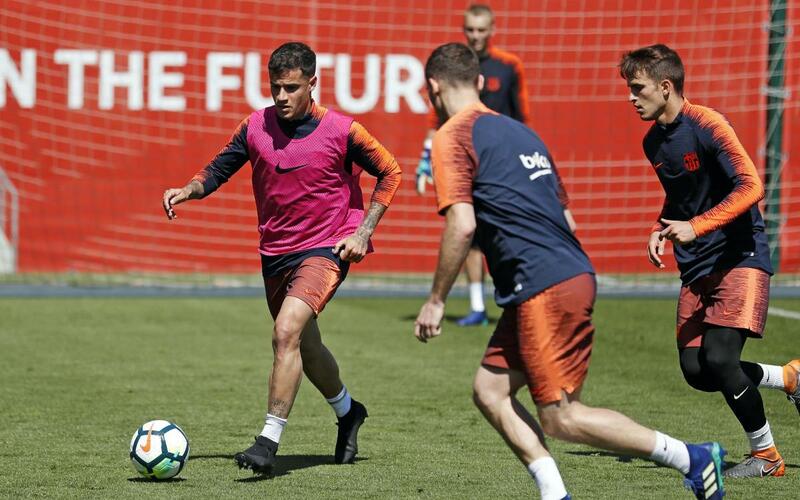 Thus, the list of 18 players called up are the following: Ter Stegen, Cillessen, N. Semedo, Piqué, Sergio, Denis Suárez, A. Iniesta, Suárez, Messi, O. Dembélé, Coutinho, Paulinho, Paco Alcácer, Jordi Alba , S. Roberto, André Gomes, Umtiti and Vermaelen. This Friday, just before the squad list was announced and prior to the press conference of Ernesto Valverde, the first team players trained on the Tito Vilanova pitch at the Ciutat Esportiva Joan Gamper. It was a session in which Barça B players Carles Aleñá and Adrià Ortolá joined in, and was the last one before the visit of Valencia.